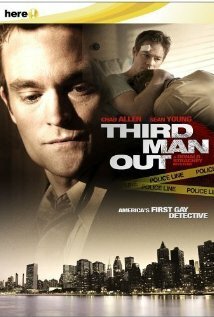 Third Man Out is the first of four films and thirteen novels that tell the story of Donald Strachey, a gay private investigator, living in upstate New York. The first film is actually the fourth novel in the series by Richard Lipez, and shows Strachey is an impossible situation. The Detective is hired by John Rutka (Jack Wetherall) a gay extremist, who runs a website that is actually devoted to outing celebrities. Rutka had been receiving death threats, which is nothing new, but when he's shot in his own home, he needs protection and doesn't trust anyone outside of the gay community. Strachey loaths the man and doesn't believe his story, but reluctantly agrees to protect him for a large payday. As Strachey does a half-hearted investigation, he's shocked when he learns that Rutka really was murdered, and even more dismayed, when he sees that the local police department, really doesn't care all that much. I know I'm going to get more than few e-mails about this, but it has to be said. I have no problem with a gay detective working within the gay community, in fact, I think it's a great twist in the classic mystery genre. That being said, the movie features a gay actor, on a gay network, married to a man. There are men kissing, there are male strippers, and there is bigotry all around them, so why is it necessary to constantly refer to the elephant in the room? The film goes out of it's way to mention the word gay and throw in a joke or comment whenever possible, and it was so over the top that it actually takes away from the seriousness of the film. The setting and characters are simply parts of a larger story and the focus should really have been more about the mystery in front of them and less about the sexual orientation of the characters. Third Man Out features a great twist in a classic who-done-it story, the acting is solid, the writing is terrific, and once it gets going, it's a very compelling story. I just wish that they had cut out some of the unnecessary satire, and stuck more to the story. There are three more films out there though, and hopefully filmmakers learned from their mistakes and let the next mystery speak for itself. Review The Ultimate Movie Review!! !